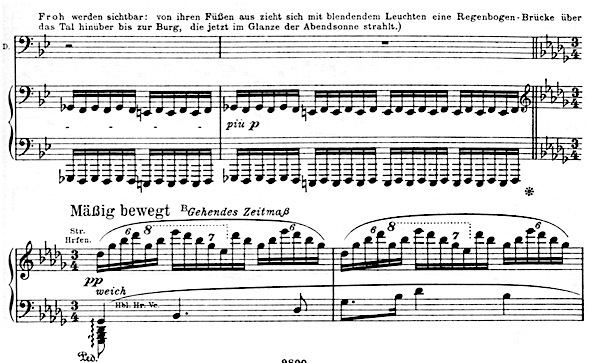 Several reviewers, commenting on this year’s new Lohengrin at Bayreuth, attributed the production’s overall colour to Nietzsche’s description of the Act 1 Prelude (in A major) as ‘blue’. It was at a performance of Lohengrin at the Bolshoi in 1896 that the artist Wassily Kandinsky claimed to have experienced his synesthesia, connecting colour and sound, for the first time. But was Wagner a synesthete? Did he associate colours with specific musical keys? As the scene transforms, Wagner’s stage directions describe a fine mist giving way to a brightening dawn light as day breaks on the mountain top overlooking Valhalla. There’s no mention of colour per se, or of the sun, leaving us to picture the bright daylight for ourselves. Nor is there much reference to colour during Scene 2, apart from Loge being a ‘damned flame’ and to gold – both of the Rhine, and of Freia’s apples. For the Giants, Alberich’s treasure is actually red: des Nibelungen rotes gold…das Rheingold licht und rot. her dämmert aus der Ferne dunkelroter Schein auf – from the distance a dark red light dawns as we hear the subterranean anvils for the first time. At Bayreuth in 1876 these and other effects were attempted with gas and electric lighting and copious amounts of steam – Patrick Carnegy gives a full and fascinating account of this in chapter 3 of his Wagner and the Art of the Theatre. In Nibelheim, it is again darkness and fog – Nacht und Nebel – into which the Tarnhelm makes Alberich ‘disappear’ when he torments Mime. Nibelheim itself is a place of darkness: Wotan refers to it as a nächt’gem Land – land of night – and Alberich warns of his nächtlichen Heer – army of the night – but without specific reference to colour. Even the serpent into which Alberich turns himself is left to our (and the stage designer’s) imagination, but the toad is clearly Krumm und grau – crooked and grey. Aus der Felskluft zur Seite bricht ein bläulicher Schein hervor – from a fissure in the rock at the side, a blue light bursts out. The key changes to C sharp minor and Erda emerges from the depths of the earth. 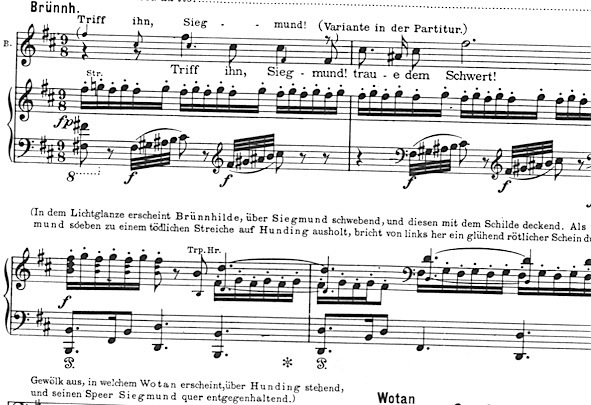 There is no specific colour mentioned in the settings for the first Act of Die Walküre. 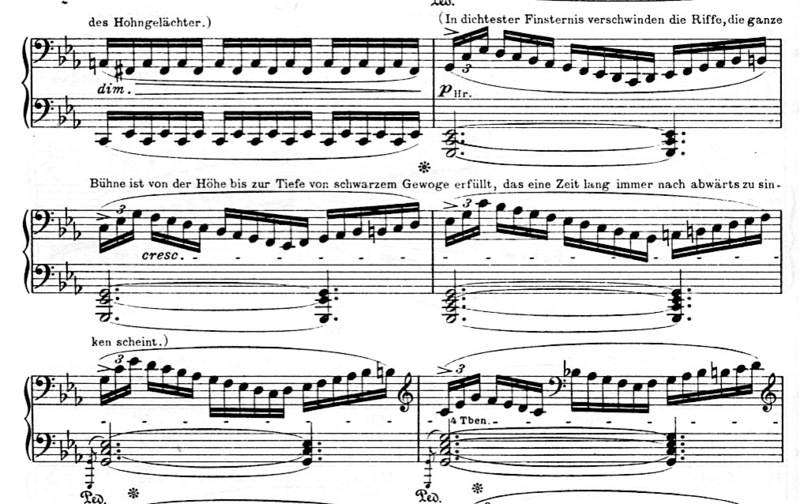 We are now in the human world (it opens in D minor, a semi-tone higher than the conclusion of Rheingold) and Wagner assumes we know what we’re looking at: a huge tree, a wooden hut, a hearth. 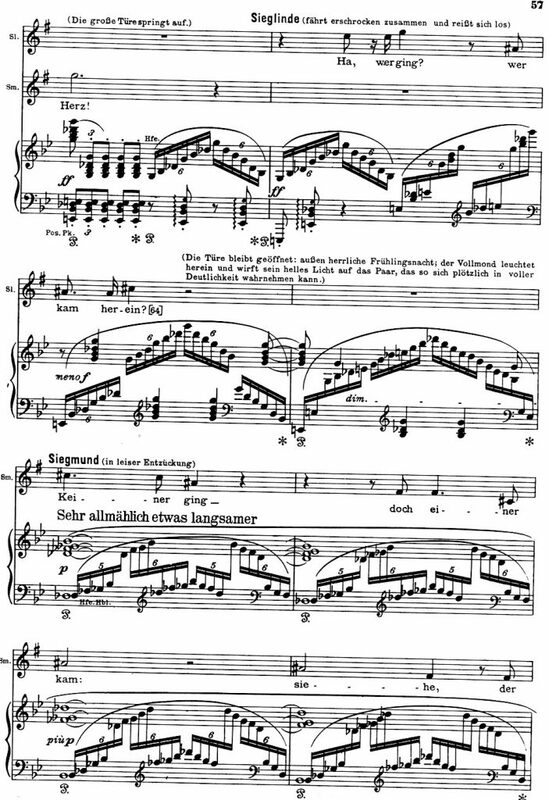 References to light are reserved for the sword flashing in the firelight, where we hear the sword motive in C major, and for the Sonne Licht which Siegmund recalls seeing in the eyes of Sieglinde. Having drugged Hunding, she returns in weissem Gewande – in a white robe – to tell Siegmund how the sword came to be buried in the tree. Only when the door of the house flies open do we read that there is aussen Frühlingsnacht; der Vollmond leuchtet herein und wirft sein helles Licht auf das Paar – Spring night outside, the full moon shines inside and throws its bright light onto the pair. 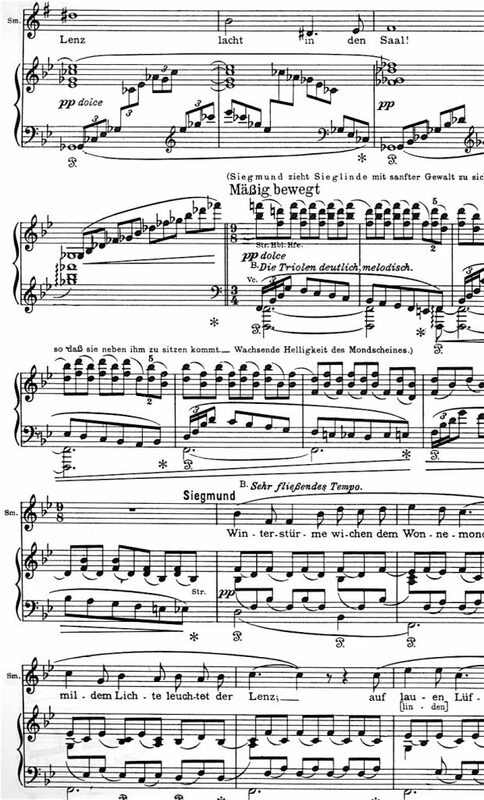 The music pivots from G major to the B flat major of Winterstürme in a dramatic and explosive modulation that expresses an emotional release, rather than one of colour. So what colour is the moonlight? It is Spring outside, and the moon is full but it could still be viewed in various shades of pale creamy white to dazzling ice-blue white colour. It seems there is no record of how this was achieved at Bayreuth in 1876. Today the theatrical convention has become to use either a 10K backlight in a light steely-blue or an HMI (Hydrargyrum Medium-Arc Iodide) which gives out a very harsh, cold pure-white colour. 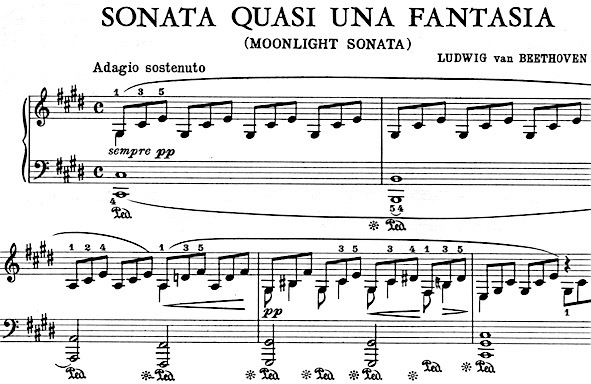 However Siegmund sings, in B flat major, of the mildem Lichte – gentle light – suggesting a warm white moonlight flooding into the hall. 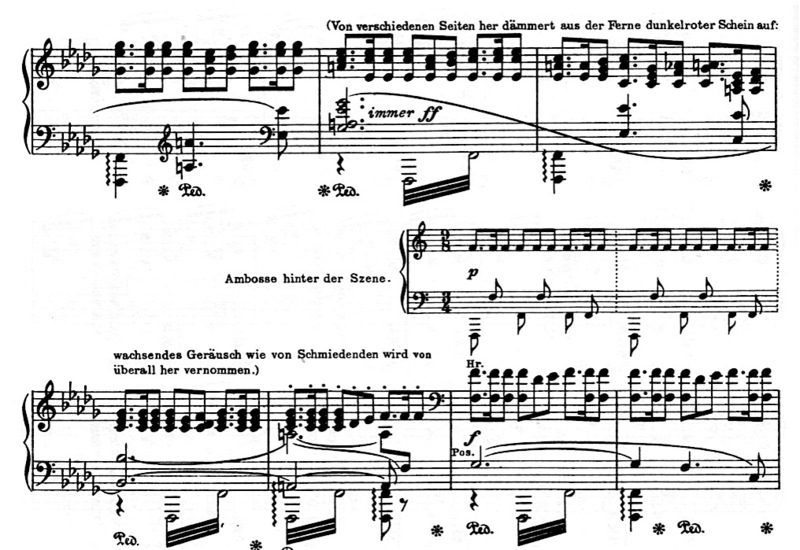 but this wasn’t Beethoven’s title for his Op.27 no.2 – it was given to the work by Ludwig Rellstab, five years after the composer’s death. The end of the Act in 1876 was made vivid, once again, with clouds of steam. Visual colour takes the back seat to music and drama here.